KAMPALA – The ongoing review of the refugee policy will seek to put a cap to spending by the NGOs on staff salaries and allowances to 10 percent of their budgets. The revelation was made on Thursday during the regional conference on the forced migration in Kampala organized by the Refugee Law Project in Kampala. Mr. Gerald Menya, the commissioner for refugees, said a lot of money is being wasted by most NGOs on staff salaries and other administrative costs instead of using it to help the affected refugees and the host communities. “We are saying the NGO spending on the administration should not exceed 10 percent. We have seen some NGOs spending a lot of money on administration and other related costs and yet the people they should have helped receive little in support. This has to end because the policy will follow it strictly,” he said. He was responding to concerns from different leaders from the refugee-hosting districts, who said that they were being marginalized in the management of refugee affairs yet they are the key stakeholders. One major concern came from Kiryadongo district chairperson Charles Ntairehoki Atwooki, who wondered whether the definition of host communities is clear. “We need to redefine the host communities. My district is feeling the pinch of hosting the refugees, yet all interventions are only made in the sub-county that officially hosts the refugees. OPM and UNHCR should come with a definition to mean the entire district. We cannot only concentrate development in one are when we even have urban refugees, yet no interventions are made in such urban centers,” he said. Innocent Ndahiriwe, a legal officer from the department of refugees in the Office of the Prime Minister, said a policy review is being carried out to address some of these challenges. 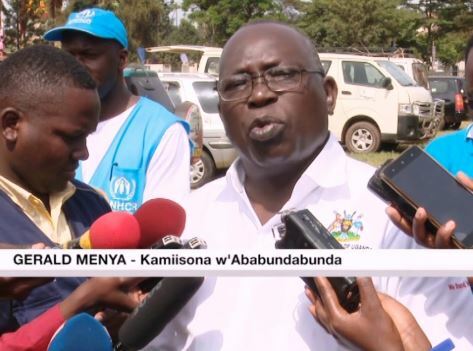 “We are aware of the issues you are raising, but as you know, we are already reviewing the refugee policy and some of them will be addressed in the policy,” Ndahirwe said. Two weeks ago, Hilary Onek, the minister for relief, disaster preparedness accused the international NGOs of hijacking the donor money generated from the refugee solidarity summit, saying only India and China had submitted their donations amounting USD1.5M to the treasury.